DonTrung added a comment to T221734: Can't add statements on mobile due to Cross-Origin Request Blocked. DonTrung created T221734: Can't add statements on mobile due to Cross-Origin Request Blocked. 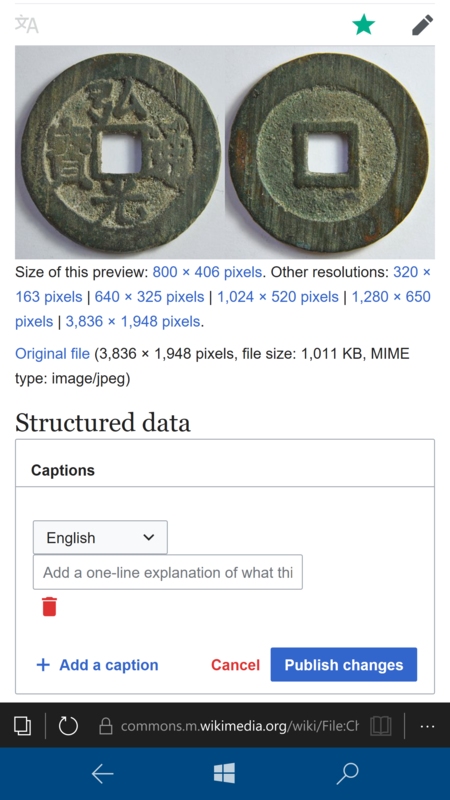 DonTrung added a comment to T220651: Can't submit file captions on Wikimedia Commons using Microsoft Edge on a mobile device. @Aklapper, oddly enough the issue seems to have been resolved, has an update to the website been issued last night? I didn't change anything on my phablet. + another clarification, I can still add file captions manually on the file pages individually, but not through the MediaWiki Upload Wizard. Also to clarify the title, I CAN "submit" them, and the MediaWiki Upload Wizard tells me that they are published, however the actual edits adding the file captions to the "Structured Data" field are never actually performed. Just to be clear, I select a file, I upload it, I give it an appropriate file name, I write a file caption, I fill in the file description, add it to the appropriate categor(y/ies), and then publish it. I do this on both devices, but while the file captions so show up on my Elephone P8 Mini (Android operating system, Ecosia web browser) they don't on my Microsoft Lumia 950 XL (Microsoft Windows 10 Mobile, Microsoft Edge web browser). DonTrung created T220651: Can't submit file captions on Wikimedia Commons using Microsoft Edge on a mobile device. DonTrung added a comment to T220277: SDC file page JS doesn't see existing captions in some circumstances. DonTrung created T220277: SDC file page JS doesn't see existing captions in some circumstances. DonTrung added a comment to T218508: Number sorting in category names on Commons should be natural (5 should be before 40). DonTrung created T218508: Number sorting in category names on Commons should be natural (5 should be before 40). DonTrung added a comment to T218156: CC0 licensing is duplicated in the UploadWizard when using a mobile browser. Note that I use the Ecosia browser on Google Android, it isn't available for Microsoft Windows 10 Mobile. I don't often get this, but it occurs usually after uploading and publishing 3 (three) times without reloading the page. If I reload the page I don't get this issue after uploading another file 📁. Restricted Application added a project to T21676: IE6 compatibility for new search UI: Discovery-Search. DonTrung added a comment to T215893: Bugs with captions on mobile. So all bugs are placed in one ticket, will they also be addressed together or if a bug fix has been made for one will that rollout earlier? DonTrung created T216327: File captions on Wikimedia Commons now appear four times using the mobile interface. DonTrung added a comment to T178144: Clarify licensing status of data on Structured Commons. DonTrung added a comment to T215927: Can't save file caption edits on Commons with mobile frontend (Microsoft Edge on Microsoft Lumia 950 XL phablet). DonTrung renamed T215927: Can't save file caption edits on Commons with mobile frontend (Microsoft Edge on Microsoft Lumia 950 XL phablet) from I can't save edits to file captions on Wikimedia Commons using the mobile frontend to I can't save edits to file captions on Wikimedia Commons using the mobile frontend (using Microsoft Edge on a Microsoft Lumia 950 XL phablet). DonTrung created T215927: Can't save file caption edits on Commons with mobile frontend (Microsoft Edge on Microsoft Lumia 950 XL phablet). DonTrung added a comment to T215470: Note the CC0 nature of structured data in the Commons page footer. DonTrung added a comment to T208494: Allow music scores to be uploaded to Wikimedia Commons. Note that there was an overwhelming support for allowing these file types during the proposal discussion (request for comment). DonTrung created T215271: Padlocks don't display on mobile (Wikimedia Commons). DonTrung added a comment to T214003: Merge the "extended-uploader" and "autopatrolled" user groups on Commons. Will it be shared in the main Wikimedia Commons village pump when this change is implement? DonTrung added a comment to T213835: The mobile editor doesn't prefill with content like the desktop editor. First I try to create an RfC by using the standard "blue button". A pardon, I missed the follow-up comment, I'll do it step-by-step below. @Aklapper, I did report further action, if you click on the link in the mobile editor it should remove all templates in the markup as could be seen in the attached screenshots. Would this then also automatically give these permissions to "patrollers"? DonTrung created T213835: The mobile editor doesn't prefill with content like the desktop editor. Did anyone ask the WMF lawyers, yet? DonTrung created T213579: Allow "Captions" on Wikimedia Commons to be edited using the mobile interface. DonTrung added a comment to T213487: Unable to edit Wikimedia Commons on desktop with Microsoft Edge. Try to zoom in with your fingers, this usually triggers these glitches. It works fine when I use Microsoft Edge on Android for me too, this issue only seems to affect Microsoft's Windows 10 Mobile operating system. Note 📝: While attempting to make the above screenshots the page crashed and reloaded around 6 (six) times within 2 (two) minutes, all (documented) zoom-ins and -out were unintentional, and these symptoms are very much akin to how Wikidata appears on my Microsoft Lumia 950 XL phablet. Maybe this is an unintended side effect of the "Captions" functions as that looks and acts very similar to how Wikidata works, although with Wikidata I am forced to go to "Desktop view" to add images to instances, this issue only affects me when I want to use tools like HotCat, cat-a-lot, and/or scroll through large pages. I will try to post multiple screenshots, but it doesn't really "appear" as a glitch until the screen re-loads (then some portions of the screen "blurr out" so to say. Alright, but is there something that could explain this sudden change? I just noticed the similarity between the glitches I experience while browsing Wikidata in "desktop view" versus the glitches I currently face. Can these issues be replicated using Microsoft Edge on a desktop computer 🖥 or laptop 💻? DonTrung created T213487: Unable to edit Wikimedia Commons on desktop with Microsoft Edge. DonTrung added a comment to T191706: It's not possible to undo edits from the revision history or diff in "Mobile" mode. Jdlrobson awarded T191706: It's not possible to undo edits from the revision history or diff in "Mobile" mode a Like token. Liuxinyu970226 awarded T191706: It's not possible to undo edits from the revision history or diff in "Mobile" mode a Mountain of Wealth token. DonTrung created T207434: The MediaWiki Upload Wizard should utilise redirects. • Tbayer awarded T191706: It's not possible to undo edits from the revision history or diff in "Mobile" mode a Mountain of Wealth token. 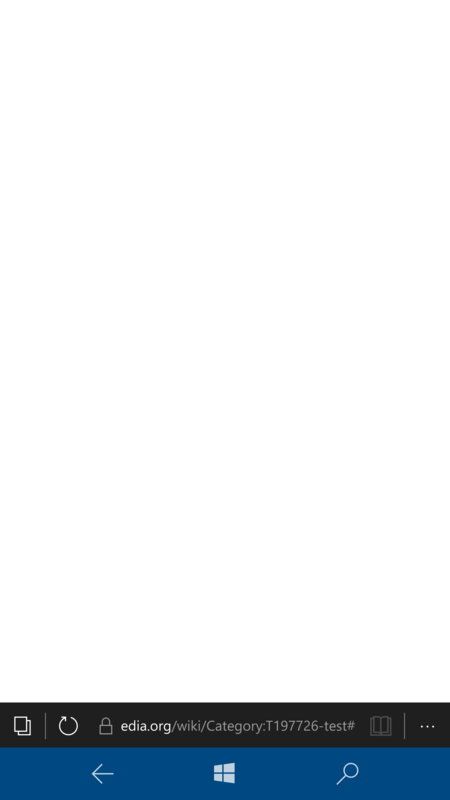 DonTrung added a comment to T205636: Next button is missing in UploadWizard again in InternetExplorer. DonTrung added a comment to T205508: Prompt administrators on Wikimedia Commons to prevent (non-Autopatrolled) users from re-creating a page. Probably best to prompt the text to prevent re-creations of the page (file name) during the deletion process as an option. DonTrung created T205508: Prompt administrators on Wikimedia Commons to prevent (non-Autopatrolled) users from re-creating a page. DonTrung added a comment to T90004: Enable Flickr import for all users on Commons. The Upload Wizard should integrate a form of Flickr2Commons but without its faults (so it should be able to spot duplicates immediately), however only a very select group of people can use this and many people already have the wrong impression that Wikimedia Commons is only FOR YOUR OWN PHOTOGRAPHS despite there being billions of free educational images on the internet and many millions of them are on Flickr. Either the marketing has to change (and users should understand that public domain images are acceptable while fair use is it on Wikimedia Commons) or the tools ⚙ have to reflect this. DonTrung created T202206: Create a tool that can import media to Wikimedia Commons from ANY website (after whitelisting). DonTrung added a comment to T2674: Allow users to be blocked from editing a specific article or all articles inside a namespace. Addendum: As in my above suggestion "Block" and "Restrict" would be teo different settings (maybe even using a separate API) these could both be in effect at the same time without affecting the other as with the above example relating to the Utah editing restrictions. Just a suggestion, but maybe a whole separate log for these "blocks" could be created called "Restrict logs" where other than "Blocks" "Restrictions" are listed, as for the suggestion to create restrictions on Wikimedia Commons users to only be able to upload files of course editing "File:" Belongs to that as these files might need to be recatrgorised. Maybe for sysops a button separate for "block" and "restrict" could also be created. DonTrung created T199728: create a tool to view all statistics (including number of files) in a category and all of its subcategories. DonTrung added a comment to T198525: Can't log into mobile on Commons. DonTrung created T199250: Allow for an option where if a sysop blocks a user on commons that they could still create files. : This talk page is not a good place for this. It belongs "
@Aklapper, not on my Microsoft Lumia 950 XL, I will try it on my wife's LG K10 (2017) later when I'm home 🏠 again. Microsoft Windows 10 Mobile 📱 tends to have a very closed down system and often when attempting to report diagnostics I am forced to try and make a report only using the Microsoft Windows Feedback app, I will try to see if I could export one of those files 📁 to the Phabricator. @Aklapper Can an administrator look into my account to see if any cookies or something is broken? Here is the full log of my sign in attempts on Commonsmobile. DonTrung added a comment to T198686: Navigation boxes and categories don't display (English Wikipedia). There's really not much to it, at the bottom of every page 📃 there simply aren't any categories or navigation templates, just look at an article like https://en.m.wikipedia.org/wiki/Mystic_Park#/random at the bottom no navigational templates or categories display on mobile 📱. I just experimented with fake sign in names like "Donald Trunk" and "Donald Trungy" and on Wikimedia Commons in the mobile browser I keep getting the exact same comment while on the English Wikipedia the sign in interface (on mobile 📱) tells me that there's an invalid username or password, it seems odd that the mobile sign in interface of only, and I mean ONLG Wikimedia Commons can't recognise this. DonTrung created T198686: Navigation boxes and categories don't display (English Wikipedia). DonTrung added a comment to T198552: Vandalism on Phabricator: Undo changes made (2018-07-01). Was this the vandal that changed the names of tasks into gibberish? And unsubscribed AKlapper? DonTrung added a comment to T198515: "No active login attempt is in progress for your session" (LG K10 (2017)). Mvolz awarded T198556: Allow the option "Thank" for page creations. a Like token. DonTrung created T198556: Allow the option "Thank" for page creations.. I checked, didn't work. 😟 Also this happens on multiple browsers. DonTrung created T198525: Can't log into mobile on Commons. DonTrung created T198515: "No active login attempt is in progress for your session" (LG K10 (2017)). DonTrung added a comment to T197726: Creating a Category talk page on the English Wikipedia in mobile directs you to a blank page. After clicking reload got this again. Odd, it does it immediately after creating for me now. I'm not sure if this is a Windows 10 Mobile exclusive bug, however I get this. Create a new category, then click on "talk", then click on "Read as a wiki page", then click on the pencil/pen thingy, then add a WikiProject template, then press "Save" 💾. DonTrung created T197726: Creating a Category talk page on the English Wikipedia in mobile directs you to a blank page. DonTrung created T196955: Add the ability to add a timer to global locks. DonTrung created T196541: Allow sysops to tweak the amount of time a medium is deleted to conform to copyright laws but also saving the medium from being lost. DonTrung created T196449: Suggest master- and sub-categories when searching for a category in the UploadWizard (Wikimedia Commons). DonTrung created T196448: Automatically redirect users to the correct category in the UploadWizard (Wikimedia Commons). DonTrung added a comment to T7106: Changing label text of "Edit page" tab when blocked. This seems like it would make sense, it's a bad user experience for blocked users to be taunted for years with a "you can edit this page" message at literally every section of an article. DonTrung created T196259: Allow for autoconfirmed users to use globally blacklisted links as references. DonTrung created T196257: Remove the "Edit source" and "Edit" buttons for blocked users. DonTrung added a comment to T196156: Clicking on "show preview" in mobile deletes all progress; ends up on unexpected page. DonTrung created T196156: Clicking on "show preview" in mobile deletes all progress; ends up on unexpected page. DonTrung created T195697: Allow for statements to be added with a mobile browser on Wikidata. DonTrung added a comment to T195575: Allow a "View all images" for categories when using cat-a-lot. Ahhh, I didn't know that that was an option, however this concerns the way categories on Wikimedia Commons work by themselves and would also allow for mass-deletion requests to be more efficient (as much as I would hate to see them in general), it's more of a request to add "view all images" to category pages. DonTrung created T195575: Allow a "View all images" for categories when using cat-a-lot. DonTrung added a comment to T195528: Issues with the mobile editor on Wikimedia Commons. Well, that's a shame, is there a reason why the inferior mobile editor is preferred? It only seems to occur on Wikimedia Commons for me, and are the developers ever planning on allowing that specific editor to mark minor edits and edit full pages rather than just sections. The issue I have with using the "full" editor on mobile is that it appears really small on my phablet and when it works it sometimes glitches (zooms in and then zooms out automatically, reloads the page and deletes any changes), which happens quite a lot. Personally I would then rather see more features added to the inferior mobile editor which just seems to exist for the most basic and minor edits. Oddly enough after I click "Save edit" it immediately brings me back to the editor.